Iceland is called the “Land of Fire and Ice” for a reason; volcanoes and glaciers define its landscape. About half of its surface is covered by lava fields and about 11% is covered by glaciers. Interestingly enough many of the glaciers are sitting on top of active volcanoes. The best way to get the full Icelandic experience is to head out to explore the rugged landscape. This was my second trip to Iceland so I chose something a little more adventurous; glacier hiking and ice climbing. 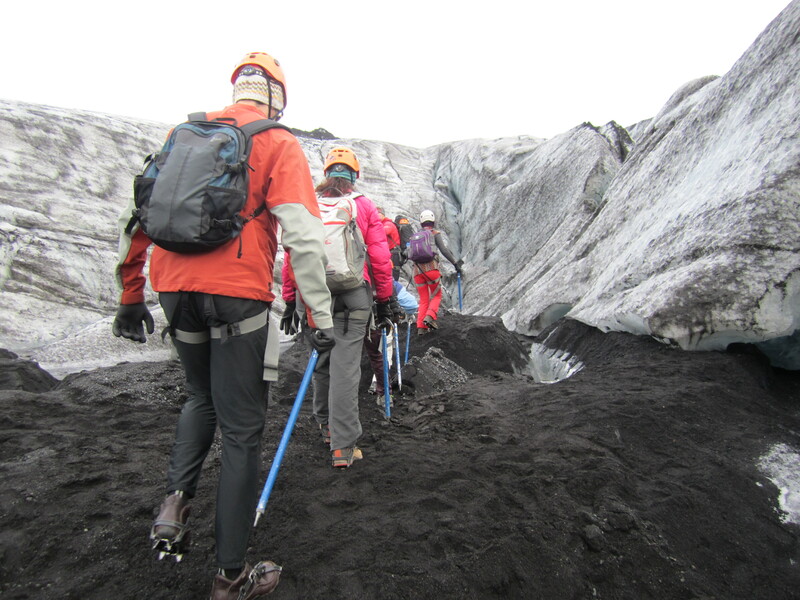 The tour is offered on Sólheimajökull, a glacier tongue connected to the south end of the much larger Mýrdalsjökull glacier. Mýrdalsjökull dominates southwestern Iceland as the country’s 4th largest glacier and it sits atop an active volcano called Katla. Sólheimajökull although connected, is much smaller at 9.5 miles long and 1.5 miles wide. The trip out to the glacier usually takes about two hours from Reykjavik, although it took our group around three hours because our bus broke down-at no fault of our guide. While we were driving the battery exploded with a loud pop, stranding us at a small gas station waiting for a new van to arrive. Our small group congregated around the coffee machine talking and sharing stories until the new van arrived. A bit off schedule, we made it to the glacier and piled out of the van. The group consisted of 7 of us: my friend and I, from Chicago, a couple from Denver on their honeymoon, and three visitors from China. Upon arrival we were each issued a climbing harness, an ice axe, and crampons. After a short walk from the van up to the glacier, we stopped to hear some basic training tips on equipment usage: how to put the crampons on, how to put on the climbing harness, what to do with the ice axes and what not to do with your axe. Apparently, as the guide demonstrated, you should not swing the axe over your head in an attacking or gouging motion. But it could be used as a helpful tool when walking on uneven glacial surfaces as additional support. We all geared up fairly quickly and set off onto the glacier. The initial hike up onto the ice was very wet and slippery. To ensure a steady footing we were advised to walk heavy, this will allow the spikes on the bottom of the crampons to stick straight into the ice. Another helpful technique to avoid slipping is to use the axe as a walking stick in areas where the surface is uneven. After a steady incline up higher onto the glacier we stopped to look around and allow the group to catch up. Over time the glacier has receded considerably, and just a few years ago the ice had stretched all the way out to where the parking lot now is. Now that we were up higher on the glacier, the ground was not as wet and slippery. The glacial surface was marked with rugged ice and areas of sharp drop-offs and deep crevasses. Continuing on at a slight, but steady incline the ice crunched loudly under our feet as we walked in a single file line in silence. After a while, our guide pointed out a large bluish ice hole. It was about six feet in diameter but we couldn’t tell how deep it was. To demonstrate the depth of the hole, the guide swung his axe into the ice breaking off a large chunk of ice. We all listened as it tumbled down the ice walls until it finally hit the bottom. He warned us of the danger of falling in and how hard a rescue would be. We all took a slight step back from the edge not wanting to find out how long that rescue would actually take. 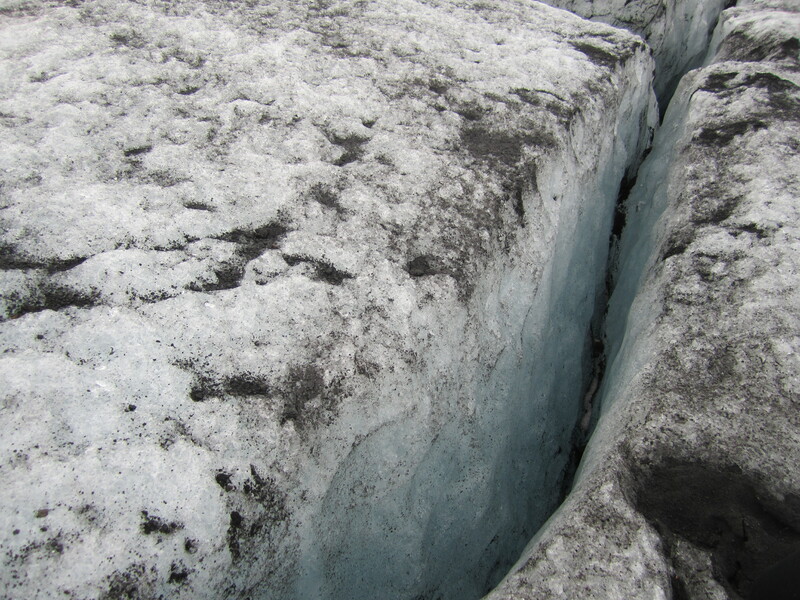 The glacier has another unique feature; deep crevasses or large cracks in the ice scar the landscape of the glacier dividing the ice into long sections. These cracks have deep vertical walls that looked impossible to get out of if you were unfortunate enough to fall in. Needless to say it is not recommended to get too close to the edge of the crevasse. Although slipping is unlikely if you walk as instructed wearing the crampons. After about an hour or so of hiking, the guide asked if we were still up for ice climbing. Although climbing a vertical wall of ice sounded scary, we all agreed we wanted to try it. We headed down a nearby slippery slope to large area enclosed by ice walls. We walked over to the far end of the enclosure and watched as the guide quickly climbed up one of the tall ice walls using just his 2 ice axes and his crampons. He secured the ropes at the very top with an ice screw before climbing back down. I didn’t think my ascent or descent would be as graceful as his. The technique was easy enough to understand but a little harder to execute. Climbers should kick the front points protruding from their crampons into the ice, then swing their axe into the ice above head and pull themselves up the wall. The strength of the ice was amazing and even sticking the ice pick in slightly kept it securely affixed in the wall. The only experienced climber in the group, a guy from Denver, was elected to go first. He quickly scaled the wall, making the climb seem effortless. When he got to the top, he was instructed to remove the axes from the ice, lean straight back pressing the bottom of his shoes flat into the ice and walk himself down. Of course he was secured to a harness and rope otherwise this technique would not work. Next a young woman from China volunteered to go. She had a really hard time getting her crampons to stick into the ice, she kept slipping and dangling by the rope or by the ice axe. Somehow this made me feel secure because the guide never let her fall. We all watched as she dangled attached to the rope while the guide continually yelled out instructions to assist her: keep your legs straight-move to the left. Unfortunately part of her problem was that her shoes were too flexible. At one point, one shoe even fell completely off and was left dangling by the shoelaces tied around her ankle. One problem was that she had put plastic bags into her shoes-we all guessed to make them more waterproof. This insert, the guide pointed out was making her shoes extra slippery and he does not ever suggest to do such a thing while ice climbing. Advice that was fairly obvious to all at this point. To top it all off, her other shoe was slipping off as well. Yet she was just determined to pick-axe her way up that wall. Obviously proper footwear is an important part of this process and climbing only using the axe and the guide’s assistance—pulling her to the next level using the rope made her attempt painful to watch. Finally, almost near the top the guide called for her to come down. We all applauded her fierce determination when she reached the bottom. When my time came, I knew I wouldn’t match the guide’s skill, but I hoped I managed to at least keep my shoes on. I kicked my crampon straight into the ice wall, heaved the ice axe into the wall above, and pulled myself up. I was happy I rented the hard inflexible hiking shoes. The straight hard shoe acted like a step that I could use to climb the wall. I got the hang of it after a bit. Still, it was difficult to get my crampon spike into the wall and I relied heavily on the ice ax which was extremely secure and never once slipped out of the ice. I was exhilarated and energized when I got near the top. I made it! It was time to take the ice axes out of the wall and lean back and walk down. This part was not easy as my crampons kept slipping and it was hard to keep my foot straight against the wall of ice. I lowered myself sloppily down to the bottom, just happy that I had made it to the top and back down without crumbling in fear. After everyone in the group took a turn, we packed up our gear and headed up out of the climbing area and back down the glacier. The total time on the ice was about 3 ½ hours. The tour is a good introduction to glacier hiking and ice climbing, and would be good for most activity levels. During the two hour drive back to Reykjavik, we got a glimpse of the famous Eyjafjallajökull; known around the world as the volcano that emitted a giant ash cloud in 2010, shutting down international air travel for weeks. Tours to go ice climbing and glacier hiking can be arranged through Eskimos; a tour company specializing in adventure tours. Depending on the time of the year it can get cold out on the glacier. Make sure to wear warm clothing, a hat, gloves, and waterproof hiking shoes. Eskimos offers the option to rent gear for a minimal cost in case you don’t want to pack them for just the one day. Ask beforehand about waterproof pants, jacket and good hiking shoes. The rugged beauty of Iceland is best discovered by getting out and experiencing it first-hand. 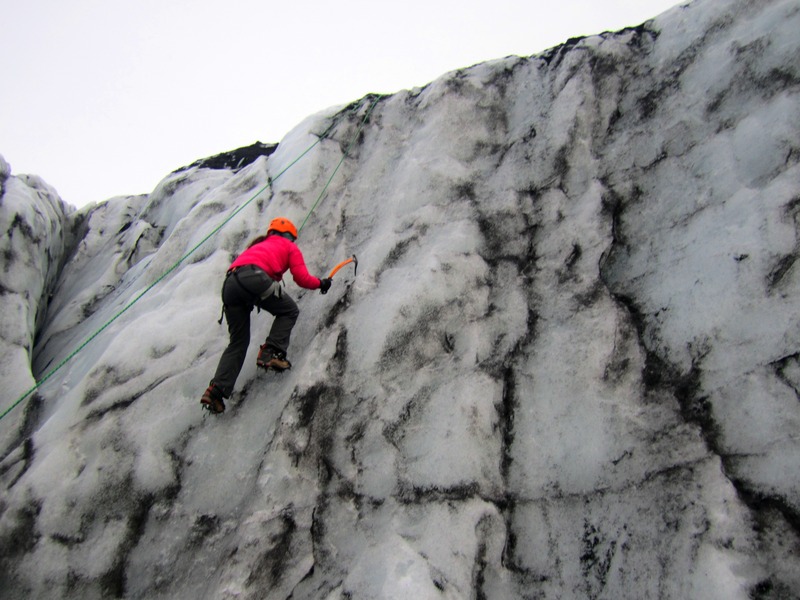 Ice climbing and glacier hiking is a fun way to get out and explore what Iceland has to offer. Not to mention, how many people can say they climbed a glacier or ice-picked up a vertical ice wall? This entry was posted in Arctic and tagged classes in ice climbing, Climb, Denver, Glacier, how to go ice climbing, Ice axe, ice climbing, iceland, iceland outdoor activities, lessons in ice climbing, Mýrdalsjökull, Volcano. Bookmark the permalink.